The candle burns brightly among the boughs of the pine. But you do not have to worry about fire or flames. 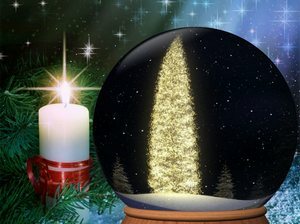 The beautiful snow globe is animated so it really shakes itself so you can watch the beautiful flakes surround the brightly lit tree. You will not want to change this wallpaper during the entire Christmas season.